Being in recovery requires rethinking every aspect of your daily routine, including how you choose to socialize with family and friends. In the earliest stages of recovery, sober socializing may involve steering clear of places where you know alcohol will be served. 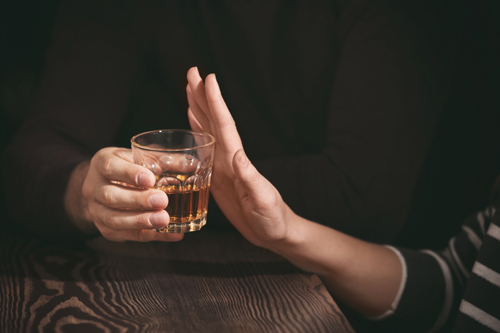 However, since alcohol is a common feature at many social gatherings, learning how to turn down a drink with confidence is an important part of the recovery process. Although many people in recovery choose to openly share their story, you are under no obligation to share the details of your sobriety with others. If you are at a party and someone offers you a glass of wine or a beer, a simple “No, thank you” is all that is necessary. You can share that you’re in recovery if you feel comfortable doing so, but you don’t owe anyone an explanation for the choices you have made. If you feel as though you need to elaborate on why you’re not drinking, but don’t want to get into the details of your addiction recovery, offering to be the designated driver for the evening gives you an excuse that reasonable people will not question. Being the designated driver also saves you money when you’re out on the town, since it’s common for bars or restaurants to provide free sodas or non-alcoholic drinks to designated drivers as a way to make sure all guests have a safe ride home. Alcohol is commonly used to deal with nervousness or anxiety in social situations. Bringing along a friend who does not drink will help you feel less awkward about sober socializing since you won’t be the only one who isn’t drinking. Your friend can also help keep you accountable if you start to experience cravings. Your sober friend doesn’t necessarily need to be someone who is experienced with recovery. Although people who’ve gone through addiction treatment or are working a 12-Step program may have a deeper understanding of the challenges you are facing, a friend who doesn’t drink because of health reasons, personal preference, or a religious view that discourages alcohol consumption can still show you how to enjoy yourself while remaining sober. Sometimes, offering someone a drink at a party is simply an attempt to be a gracious host or to show good manners. If you already have a soda or non-alcoholic beverage in your hand, you can avoid the awkwardness of declining any alcohol that is offered. If desired, you can keep your beverage in a colored or covered container so it’s not immediately apparent what you’re drinking. If you’re visibly occupied, other guests may assume you’re just too busy to stop for a drink. Depending upon what type of event you are attending, serving food, taking pictures, dancing, showing other guests around the premises, entertaining small children, or helping to clean up at the end of the evening are just a few tasks you could do to avoid inquires as to why you aren’t consuming alcohol. Unfortunately, it’s possible you may encounter people who continue to push you to drink despite your best efforts to convince them that you want to stick to non-alcoholic beverages. These people can be frustrating, but keep in mind that a stubborn insistence that you need to drink to enjoy yourself may be not even be about you. Often, people who insist that you join them for a drink are secretly worried about their own alcohol consumption. Deep down, they may be wondering if they are drinking too frequently or if drinking alcohol has begun to replace other activities they once enjoyed. They may have even tried to cut back in the past with no success. By pressuring you to drink, they’re trying to reassure themselves that they don’t have a problem with alcohol abuse. Staying true to yourself shows these people that recovery is possible. When you excuse yourself from the situation instead of succumbing to pressure, you’re staying true to your own goals and being a role model to others who may someday decide they need to seek treatment. If you or a loved one are in need of help from addiction, please contact our alcohol treatment in Pennsylvania Grand Canyon today.